A guy walks up to the bar in his pajamas… but it’s not a joke! Having your own home bar has never been easier. We have all the essentials you need, in styles you’ll love! Create a stylish and functional bar area complete with storage and seating for your very own happy hour – right at home. 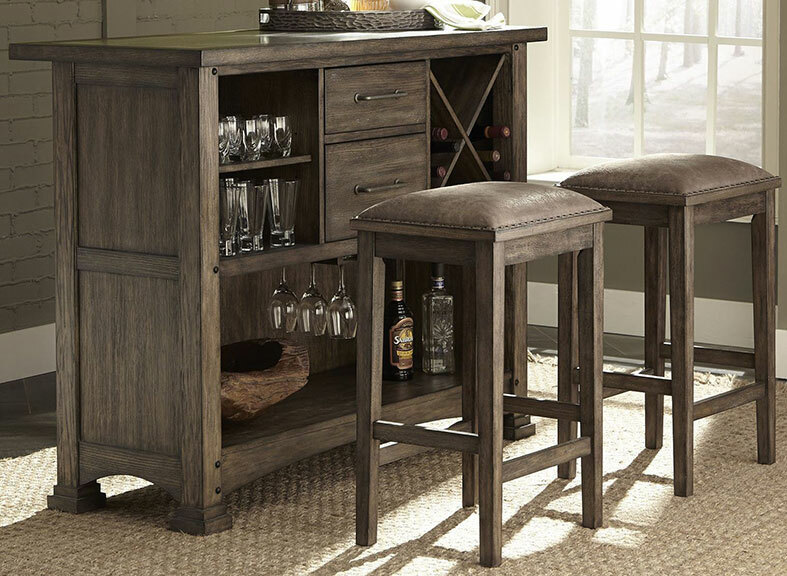 Exclusive Furniture offers home bar furniture, including wine cabinets and barstools, to match your decor. Our bar combines the warmth of natural materials with the industrial appeal. This full-service bar is open for business, providing plenty of storage. This Stone Brook bar set is a handsome statement piece. Enjoy the crisp taste of your favorite adult beverages without leaving the comfort of your home with the Cerveza Bar Set. This black home bar will be a perfect fit to any home with any style. Host a party to watch your favorite sports teams with the help of this bar set. Beautiful antique looking set with smooth quality finish, this antique bar set features one functional drawer, 10 bottle wine rack a concealed storage area behind doors and two barstool for a comfortable seating. Uplift the nature of Southern styled home with this Natural Barrel 3 Piece Bar Set. This bar set, although simple in appearance, is much more in other areas such as quality and durability. The natural essence that this bar set brings is sure to provide an astounding aesthetic that is hard to ignore.